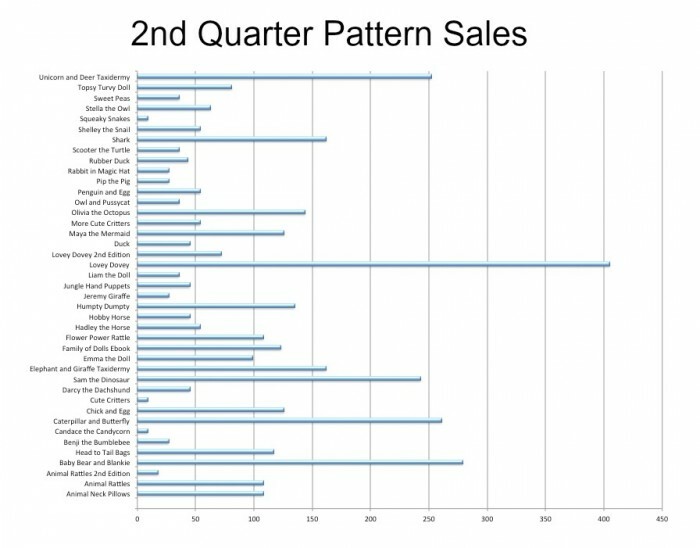 Pattern sales continue to make up the bulk of my revenue, coming in at 51%. I got some royalties from my first book, The Artful Bird, and from my Simplicity patterns which was a nice boost. My royalty statement from my second book, Stuffed Animals, is issued in the fall. I’m hoping to see some income from it then (fingers crossed). Selling resale goods in my shop has been a great move. These include rattle inserts, hemostats, squeakers, and music buttons. I try to only stock specialty toy-making products that you can’t find in your local craft store. This quarter I added cute safety eyes to that list and designed a special pattern to go with them. Launching the two together was a good strategy because both sold well. My business-to-business ebooks continue do nicely. They make up 13% of my total revenue even though there are only two of them (compared to 41 patterns). 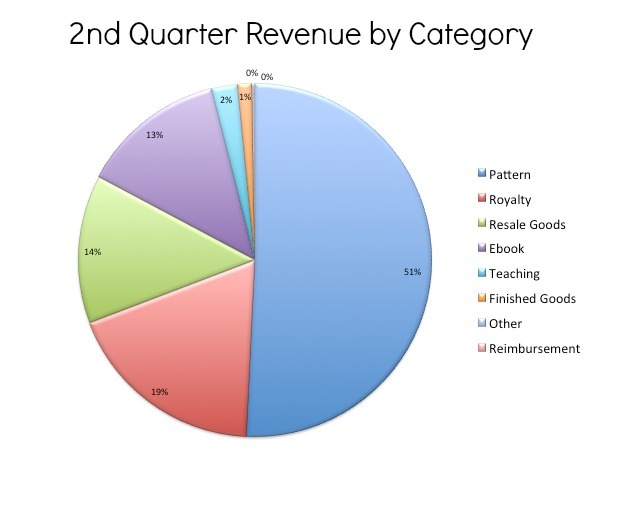 I’m working right now on a third business-related ebook and looking at the graph I think that’s the right move. I have many blog readers and podcast listeners who come here for business advice. They might never buy a toy pattern so I’d like to have more offerings for them, plus I love writing about business. The Lovey Dovey continues to be my best-selling pattern, with the Baby Bear and Blankie Set coming in 2nd place. What I’ve learned is that a large proportion of people who buy sewing patterns for toys are making something for a new baby or for a very young child. No matter what other things I may want to design, the money is in patterns for baby toys. I’m excited to see that my Unicorn and Deer Faux Taxidermy pattern has done so well. It’s a new pattern and earned $252 in a short time. Why? They’re great nursery decor. The message here? Babies. I successfully moved my website from Typepad to WordPress this quarter. I hired a designer to create my new site and to come up with new branding for my business. This move took up a tremendous amount of my time and energy and money. I had a ton of work to do to get the new site up and to learn how to use it. There was also a lengthy stretch in which I was paying for two blogs and two shops (on top of Etsy). This was the first time I reinvested earnings into my business and let me tell you, it was scary and continues to be scary. It was also great and I’m so proud of how things look now. I have a professional home for all of my ideas and all of our conversations. Hooray! My total expenses this quarter were $5,264. Yeah, whoa. As you can see, 60% of it went to a web designer and developer. No more money this year on the website, okay? One of the things I want to point out here is that running an online business is not free. 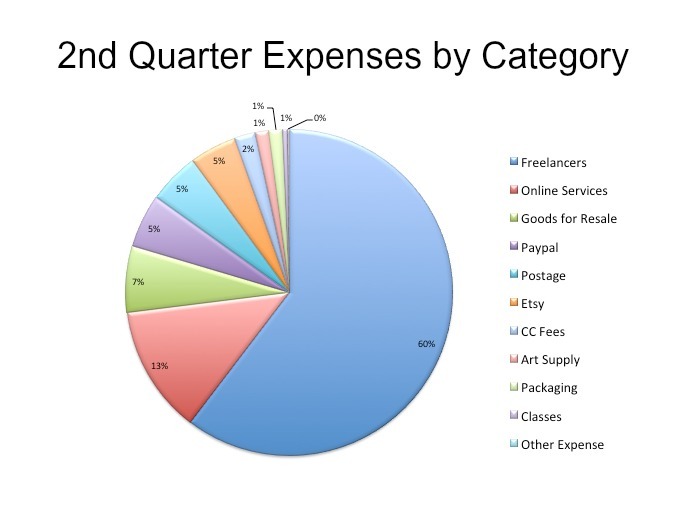 13% of my expenses were paying for online services including: web hosting and plugins, MailChimp ($50/month) and Podbean. Most of these services are free when you’re small, but once you’ve got a significant audience you pay for them. Now I pay to blog. I pay to podcast. I pay to send out my weekly newsletter. In comparison, I spend a total of $71.24 on fabric, thread, and stuffing combined this quarter. It costs very little to make toys, but it costs quite a bit to do what I do online. Just a little translation for you so you can read the graph…”Goods for Resale” is the cost of buying supplies wholesale that I then resell in my shop, including copies of my own books which I buy for 50% off the cover price from the publisher. “CC Fees” is credit card processing fees for direct checkout on Etsy and in my own shop. “Etsy” is Etsy listing and transaction fees. One great thing I learned about the 2nd quarter is that there are no corporation fees to pay to the state. Those were 17% of my expenses in the first quarter so that’s nice. Gross income year-to-date is $19,625. Last quarter I had two very lucrative guest posts on blogs that have a very wide reach (a SewMamaSew post about my Insider’s Guide ebook and a Crafty Gemini video my Family of Dolls patterns). Those two posts boosted my sales tremendously. I need to seek out more of those opportunities in the second half the year. So that’s where I stand. As usual, I have tons of idea and lots of energy to put towards them. I’m not in this to get rich and guess what? I’m not getting rich 🙂 But I’m crazy happy and I’m making it work. That’s so nice of you to say. Thank you! As a quilter with an Etsy shop I am considering offering patterns in the future. I appreciate that you are sharing this part of your business, which is so often a mystery to anyone starting out. I also just bought your stuffed animals book and began reading it last night while we waited for the storms to pass. I think it will be fun to challenge myself with some 3-d sewing. Thank you for sharing! Thank you for sharing this information. I am a CPA and this is very interesting to me. I am starting a pdf sewing pattern business and bought your ebook, Starting an Online Sewing Pattern Business. I am not finished yet, but have already gotten new ideas and confirmed some old ideas. I love your blog and podcast. Keep up the good work! Thanks for sharing. I think it’s important for people to see that it does cost money to run an online business. I personally find that I’m more motivated to get things done when I’m paying for a service like a podcast host and an email marketing service. 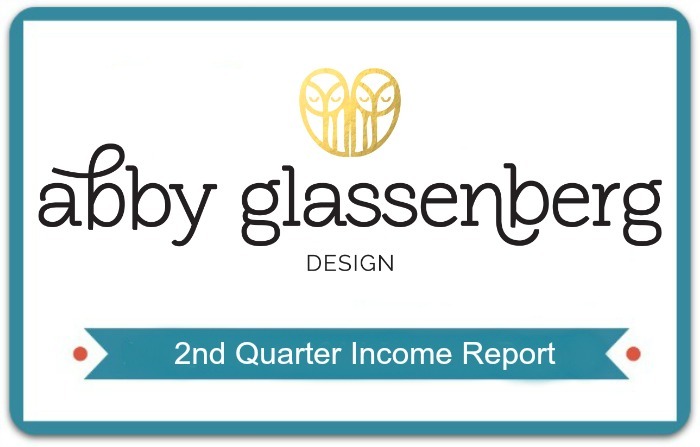 I find it very motivating to see real income reports as well. I think the investment you have made into your website will be well worth it. It’s already easier to browse around and find what I’m looking for. Have you noticed an increase in page views or a decrease in your bounce rate since you had your website redesign? I totally agree that paying for things helps me commit. I have seen a increase in pageviews since moving my site to WordPress, although it’s taking time because all of the backlinks that were to my whileshenaps.typepad.com URL are permanently broken (Typepad doesn’t offer 301 redirects) which has been a bit of a bummer. Congratulations on your growth, Abby! I’m finding it’s so very hard to balance all of the aspects of a crafty business, and you’re doing such a great job. A few years ago I was at a crossroads, trying to decide whether to hire an assistant of some sort to help (I was selling lots of tutorial on Etsy at that time). Unfortunately changes in the online world caused that business to drop significantly, so I knew I could no longer think about hiring help until I made more money again! But I’d love to hear your take….maybe a blog post…..on balancing the decision to “go it all alone” and when it’s time – or not- to add a part- or full-time employee. That’s a great blog post idea, Deanna. I think I would need to find someone who has hired an employee and then interview them. Although I outsource things from time to time, I don’t have any plans to hire help myself. Maybe I can do a quick informal survey on Twitter and find some people who have done it who might be interested in sharing their experiences. Thank you so much for sharing this. While I’m not ready to start my own business online, it is nice to know that crafty bloggers like yourself are willing to freely share this very valuable information about running an online business. I also like to say that I think it is great that you pointed out the cost of services you pay for having an online presence. Too many people expect everything for free and don’t realize the expense that goes into it. I work in IT and am fully aware of the expense and I am always willing to pay a reasonable fee for online services that are valuable to me. And I’ve also started buying most of my sewing patterns from people like yourself who are supporting a family with the income. I much prefer to do that. And I also find it interesting that you design for Simplicity. Makes me feel less guilty for purchasing a few of those as well. I will need to see if I’ve ever bought one of your patterns. I am just the type of visitor you mention who comes here more for business advice and not so much sewing (although I love crafty stuff too). I appreciate your generosity in sharing your experience and wisdom–plus I just like your style. 🙂 Thanks! This is really enlightening., thank you for giving us a peek. It all looks so beautiful and easy. I enjoy reading about the business side of blogging. Thank you! Thanks Jill. I’m not sure it’s easy, but I do enjoy it. I’m glad you like reading about the business side of blogging.